Honda West | Articles | 2016 Honda Pilot Is Back…..
2016 Honda Pilot is back at the head of the class. It’s out with all the macho, boxy styling as Honda has gone for a much more streamlined look with the new 2016 Pilot. The 2016 Pilot has been completely redesigned bumper to bumper, inside and out. Mid-size SUVs are increasingly sought-after in this country as family preferences shift away from traditional minivans, and the old Honda Pilot was getting a bit long in the tooth and needed a major overhaul if it wanted to, once again, be a major player in the segment. Once akin to a beefy CR-V, the Pilot adopted an unmistakably more chiselled look for the 2009 model year. Its distinctive design—a tribute to refrigerators everywhere— was disliked by most, though it did at least serve to distinguish it from the rest of the pack. Either way, the current redesign is welcome news and improves the Pilot in just about every way. The moment you lay eyes on the 2016 Pilot, it’s obvious that none of the styling from the previous generation has carried forward. 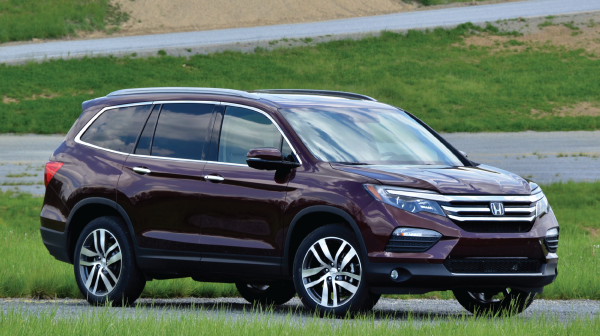 The 2016 Pilot is longer both overall and in wheelbase. It’s also wider than its predecessor as well as a few millimetres shorter in height for some improved aerodynamics. The front-end of the new Pilot won’t please everyone, however, the chrome grille with integrated headlights is admittedly handsome, especially with the LED daytime running lights. For 2016, the Pilot also features a new side window shape, and here we tip our hats to Honda’s designers for not bowing to a triangular quarter window. With the Touring edition’s 20-inch wheels, the Pilot looks especially sharp. Consumers will have to settle for 18-inch wheels on the other versions. At the rear end, the Pilot is somewhat reminiscent of Acura models, with taillights that are no stranger to the Honda luxury division’s vehicles. That said, a similar design was also seen earlier this year on the new Honda HR-V.
Honda generally offers vehicles that age well and the new Pilot looks like it should stand the test of time. The interior of the previous generation Pilot was seriously beginning to show its age, especially when it came to the dashboard. So, Honda started from scratch to create a new dashboard design that is decidedly more contemporary with better quality materials. Behind the wheel, engineers integrated a colour screen between the two traditional gauges that exemplifies the improvements made to the Pilot. 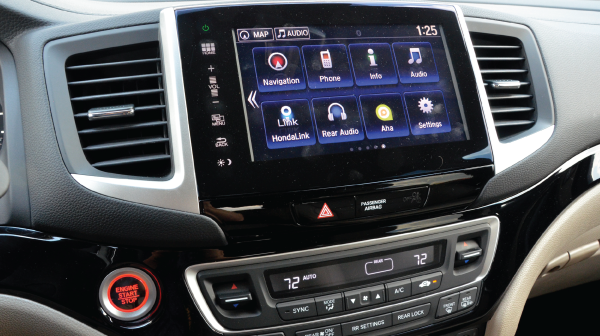 The screen provides a wealth of information for drivers, who won’t have to divert their gaze to the eight-inch infortainment system touchscreen. Although easy enough to use, the latter’s left-hand commands are less user-friendly. Thankfully, audio controls are also mounted on the steering wheel. Front row seats are very comfortable, and second-row passengers can expect to benefit from the same level of comfort from either a bench seat or two captain’s chairs depending on the chosen configuration. Like the second-row seats, the third-row bench seat folds neatly into the floor. The third row is obviously less roomy and not recommended for tall people on long journeys, but this is the case for all SUVs in the class. A little button located on the side of the second-row seat that makes it possible to access the rear is also super practical. Honda needs no introduction when it comes to its engine expertise. Although the 3.5-litre V6 used up until now has always stood up well to the other engines in the class, the five-speed automatic transmission clearly needed at least one extra gear. This is why Honda re-engineered a few things on the Pilot for 2016. The Pilot retains the 3.5-litre V6, but power has been boosted to 280 horsepower (from 250 on the previous generation). The cylinder deactivation system allowing the engine to run on only three cylinders is also back. More power is nice and all, but has there been any innovation with regard to the transmission? Thankfully, the answer is yes. The base model’s automatic transmission now has a sixth gear, making the Pilot more fuel efficient. The Touring edition meanwhile comes with a nine-speed ZF transmission that is already available on a few Acura vehicles. The ZF transmission comes with a push-button gearshift between the front passengers, whereas other versions of the Pilot come with a traditional shift lever. Honda will continue to offer a front-wheel drive base model, despite its lack of popularity. The all-wheel drive edition is a far more attractive option when it comes to the Canadian climate. You can count me among those who loved the performance of the previous Pilot. While, obviously not as nimble as a sports car, the big SUV nevertheless performed well in all situations, highways or backroads. If there was one thing the Pilot had to improve on though, it was soundproofing, and the passenger compartment has been much improved in this respect for 2016. This is obvious as soon as you close the doors. Now cozier on the inside, the 2016 Pilot is also as nimble as ever on winding roads; the steering is relatively precise, making the Pilot fun enough to drive. The Pilot accelerates convincingly, but don’t expect to be thrown back into your seat, as this SUV is no featherweight. The suspension is above all else tuned for comfort, but remains firm enough for at least a somewhat spirited drive. In terms of transmission, the nine-speed transmission does however spend a bit too much time searching for the right gear. The S (Sport) mode does make it possible to hold the gears longer though. The six-speed transmission meanwhile holds its own with nice smooth shifting. The new 2016 Pilot is more refined at all levels and is without a doubt one of the best crossovers in its class when it comes to road handling. Honda will continue to offer four trim levels for the Pilot, namely the LX, EX, EX-L and Touring. 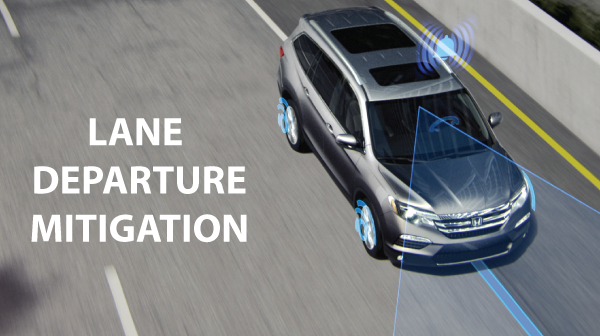 Although upper trim levels are worth a look, the all-wheel drive LX model equipped with the Sensing suite of technologies that keep an eye on the road (intelligent speed control, forward collision warning, lane departure warning, etc.) offers a nice overall package.